Take on any mission with a chance of showers with this new, ultra-soft, impossibly dry jacket engineered with Gore-Tex® from The North Face. Pairing a stretch-woven exterior for extra mobility with an ultra-soft knit interior to keep you warm and comfortable, this totally waterproof rain jacket doesn't feel or sound like an average rain shell. Take on any mission with a chance of showers with this new, ultra-soft, impossibly dry jacket engineered with Gore-Tex® from The North Face . Pairing a stretch-woven exterior for extra mobility with an ultra-soft knit interior to keep you warm and comfortable, this totally waterproof rain jacket doesn&apos;t feel or sound like an average rain shell. Designed for ultimate versatility in unpredictable conditions, an adjustable hood and pit-zip vents allow added ventilation in warmer weather. Come rain or shine, seek no shelter in the new Apex Flex GTX jacket. A soft shell technology breakthrough. 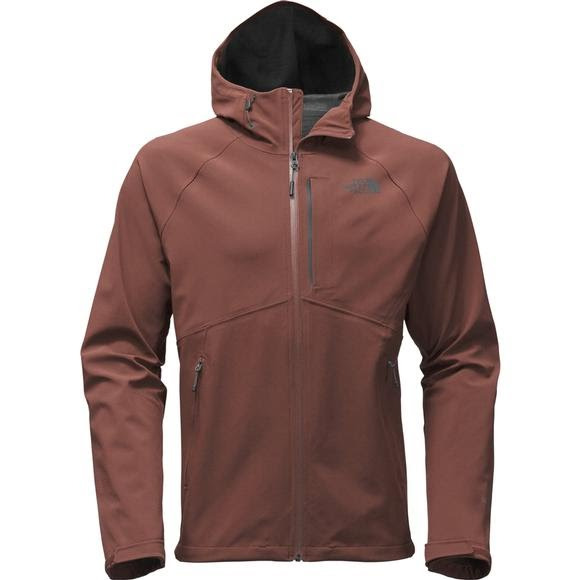 Apex is a signature material, researched and developed exclusively by The North Face, making the fleece/shell combination possible through its proprietary blend of characteristics. Apex offers the dynamic duo of a tightly woven abrasion-phobic face for protection, and a soft-brushed interior for performance and comfort. Apex technology is built to stretch for comfort and mobility and is treated with our Durable Water Resistant (DWR) finish. Jacket is a good fit, comfortable, and looks good. Material seems well-made and jacket is good protection for rain. I liked this purchase and would recommend this jacket.